PJ Selarom, an Air Force veteran, is a lover of mythologies, inclusivity, and comics. He ventures to combine these ideas in his wonderfully dark adventure of love, religion, and politics. He’s always loved writing even during elementary school when he wrote “Spider’s Birthday Party”. During his middle school years, he wrote his own musical with no music and won an award for storytelling Dr. Seuss’ “Bartholomew & the Gobbledygook”. This epic series was initiated at age fourteen and has evolved, as the author has, nearly 35 years later. What evolution!! He has a medical degree, won awards in acting, was in English honors, and resides in a treehouse somewhere in the country taking care of his baby unipegon. He can be reached at PJSELAROM.COM which connects to his Facebook and Twitter at the bottom. The Jode: Part 1: Gen. Ygl & the Genie by Mr. PJ Selarom is a fantasy novel that can be enjoyed by readers of any age. 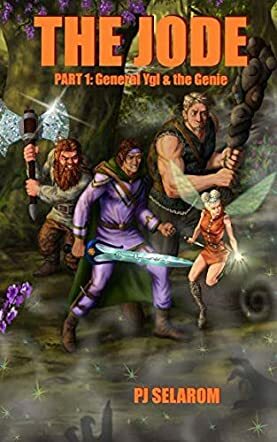 This story is woven in a way that makes it enjoyable for teenagers, Young Adult fiction enthusiasts or even older readers who enjoy good fantasy fiction. I loved it and enjoyed it immensely because it is a well developed story with strong characters that just make reading this novel even more entertaining. Life is not easy, especially for General Ygl, a man of witty retorts and great efforts. The Inner Earth is a beautiful place where different ideologies thrive together and General Ygl of the Lorel Elves enjoys his time there. The people living in Inner Earth might be different from one another in more ways than one, but they enjoy the peace and tranquility that they have. However, when their peaceful existence is threatened by Emperor Rondo and Xurchon, the god of evil, the people know that they must unite as one to fight against it all to survive. General Ygl, Flower Juna and a chosen few can truly help the people and ensure that they survive and exist as they want. But how can a handful of people fight against the likes of a god and an emperor? Told from the perspective of two very different beings, the story grabs the attention of the reader from the beginning. You want to know more about the Inner Earth because of the way the author writes about it. You want to know how their dialects came to be and how every single character is living in this vast and well built universe. I enjoyed how impressive the narrative was and how vividly the imagery came across. I was transported into the Inner Earth and I walked beside Ygl and the rest of the crew. This is simply an amazing and wonderful novel.